My name is Terri and I thank you for visiting this website! I am an electrical engineer who is crazy enough to leave my job for solar missions. I felt compelled to spread the love of Jesus Christ through the use of my training and technical skills. God first connected me with an organization called SonLight Power in May of 2009. I went on my first mission trip that June and instantly became addicted to solar missions! :). I have been on 25 mission trips to Honduras, Haiti, Nicaragua, Mexico, DR Congo, Panama, and the Dominican Republic. My husband and I now live in Honduras, from where I continue to be sent out on missions both in Honduras and to other countries. I know this is the calling the Lord has placed on my life and I absolutely love doing it! If you are interested in learning more about my work and possibly partnering with me in spreading the light of Christ please read on. 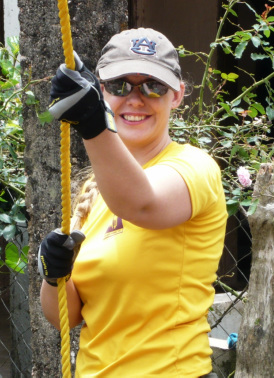 If you wish to contact me, email me at terri@solarmissionary.org. I would love to share my experiences with you, your church, or other organization.